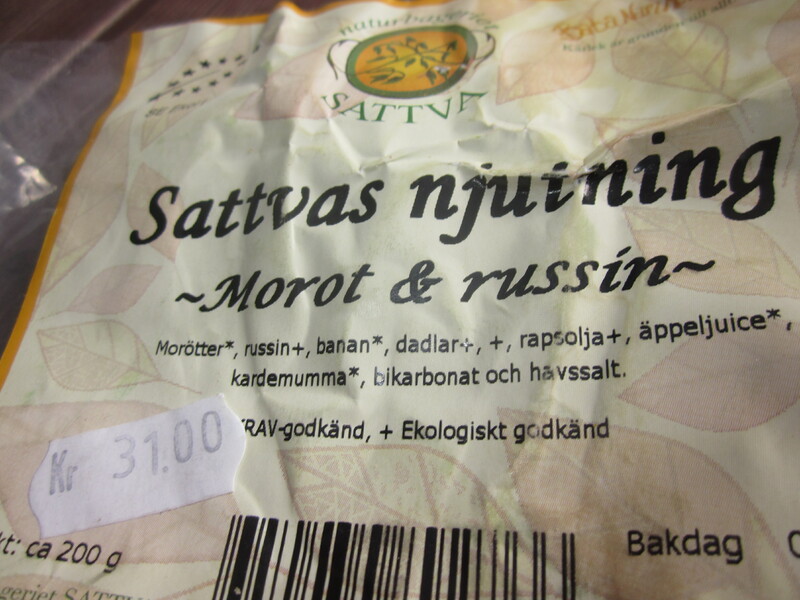 There is a very special bakery here in Stockholm, Sattva bageriet. They bake using as much organic and locally produced ingredients as possible. 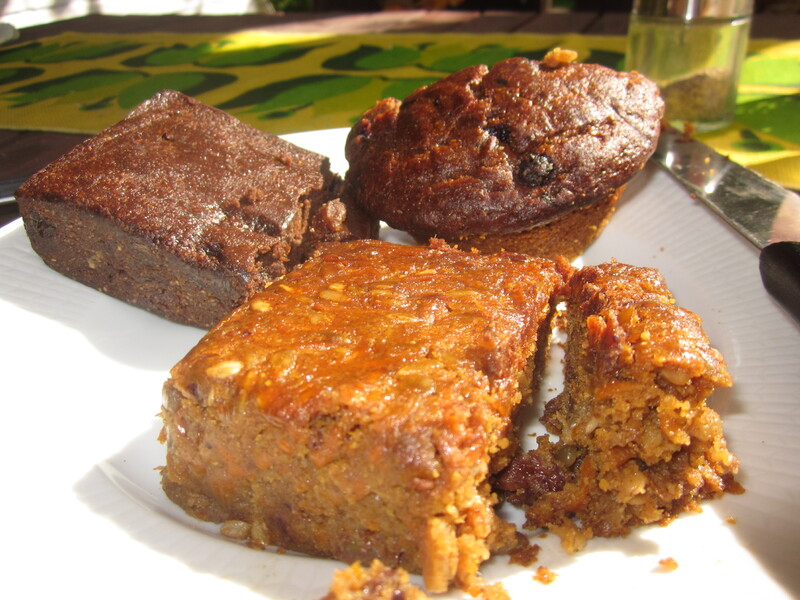 They have a wide selection of vegan cakes, cakes baked using natural sweeteners (dried fruit) and gluten-free baked goods. Their breads, pies and sweets are magic 🙂 You can really tell that they where baked with love-Love food! We sell them in the health food store where I work and they are very popular with the customers. 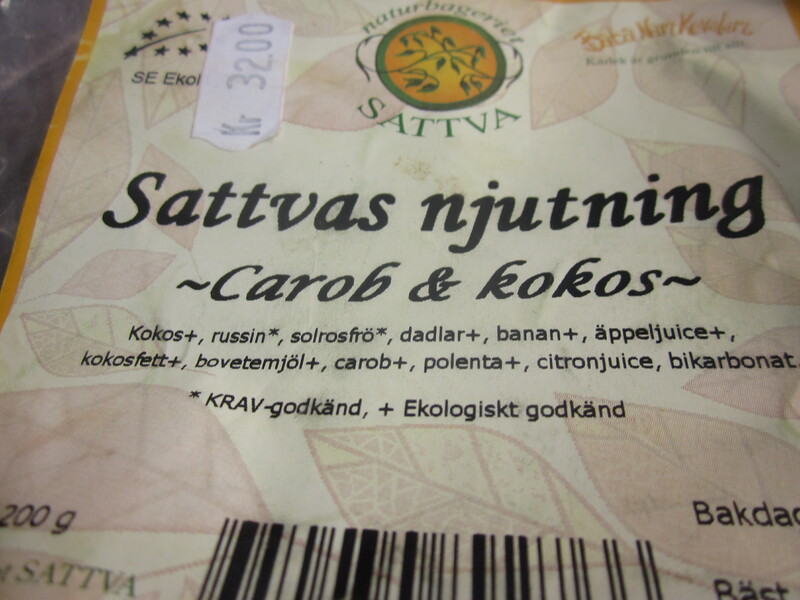 Today I sampled the Blueberry buckwheat muffin, “Sattvas njutning” carrot/raisin and carob/coconut. The last one was my favourite. All gluten and sugar-free. The carob cake for example was made from just coconut, raisins, sunflower seeds, dates, banana, apple juice, coconut butter, buckwheat flour, carob, lemon juice and baking soda. A healthier treat! When will conscious food like this become widely available in the supermarkets? 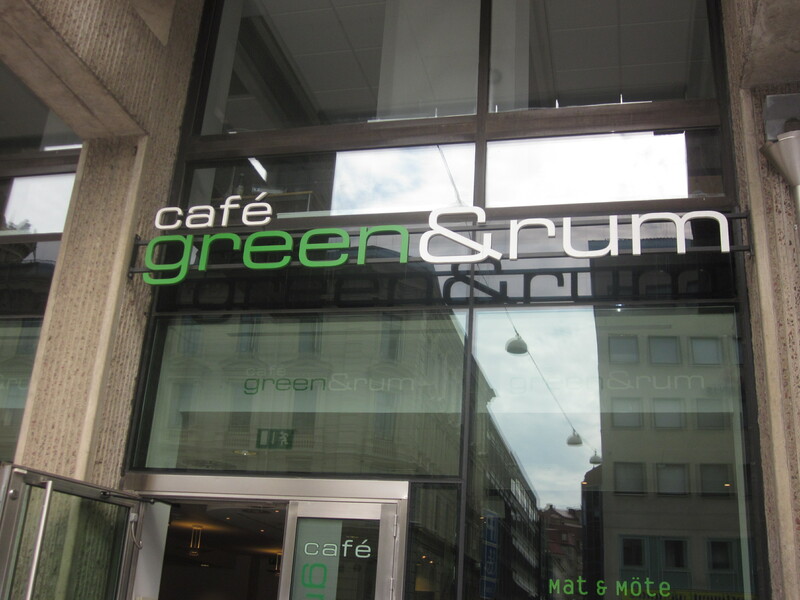 Can’t wait until that day, food-hunting will become a lot easier..
Today I found a piece of raw food pie at Café green & rum in Nordstan, Göteborg. It was a nice pick-me-up to bring on my never ending, 6 hour busstrip back to Stockholm. Last summer when I went to the same place they served a raw food luch also, but these days they have just the pie. As you can see from the pic it wasn’t fancy in any way and the cashew cream was not properly blended (supposed to be smooth). But I was still happy for having it. Raw food pies (unless you make them yourself) don’t come by that often around here. A classic bearnaise sauce is made from eggyolk, clarified butter, vinegar, tarragon, shallots and pepper. 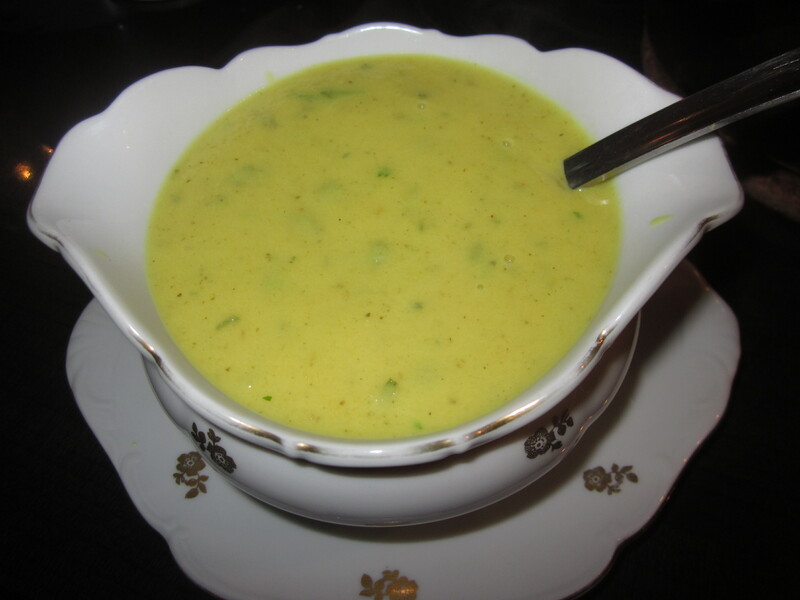 I experimented a bit and came up with this vegan sauce which kind of looks like bearnaise and has the same seasoning. Parsnip bearnaise sauce Sautee some shallots for a few minutes with white pepper and tarragon. Add some white wine vinegar and then some peeled chopped up parsnips (and some root celery if you like) and water to cover. Also put some good vegetable stock. Cook until soft and blend smooth. Add coconut milk, a little tumeric (just for color), more tarragon and some sea salt. Taste to see if it needs more vinegar. Heat up gently and there you have it- Parsnip bearnaise. This weekend I visited Copenhagen, the capital of Denmark for the first time of my life. 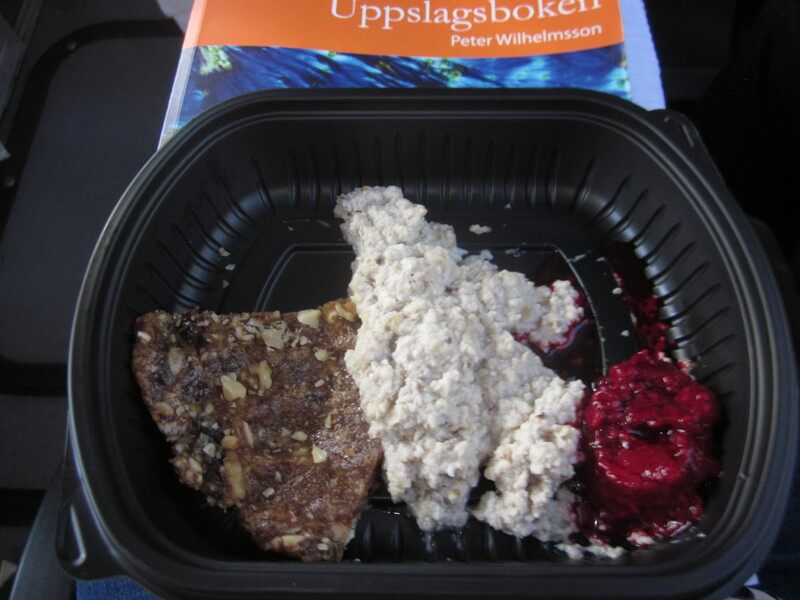 After spending a few days at Living Foods institute I was lucky enough to catch a ride there with two nice danish ladies. Denmark is so close to Sweden but from my experience very different – in a good way. I look forward to going back already.. 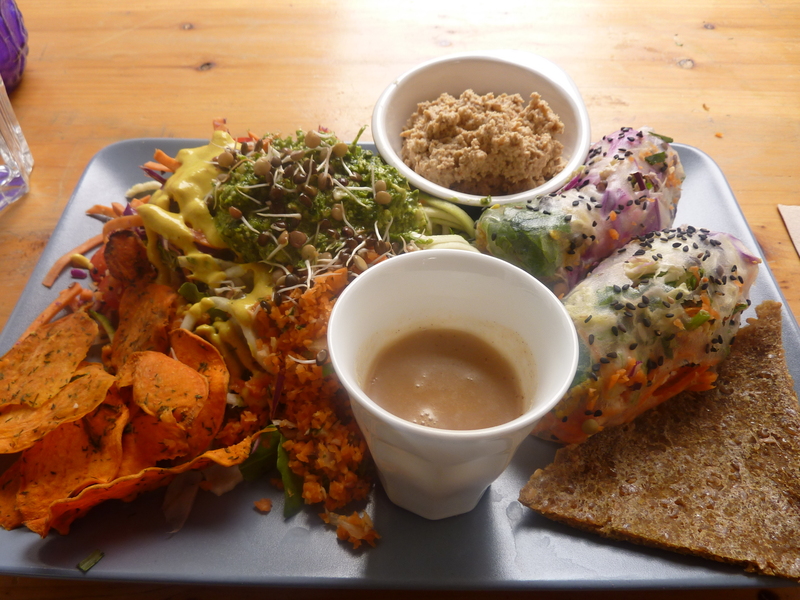 I was super excited to visit a few of the 4-5 raw food cafés that are there. First stop was Raw Tribe on Blågårdsgade 2a. It was a rainy and gray saturday afternoon but the food was everything but dull! It was the best raw food meal I ever had I think. I was suprised to see that the prices where really reasonable too. On the menu they had a big/small plate of veggies, pizza, pasta and sandwiches and more. There also was a juice/smoothie menu with wheatgrass shots and “raw espresso”(cacao beans and ??) and other interesting items. 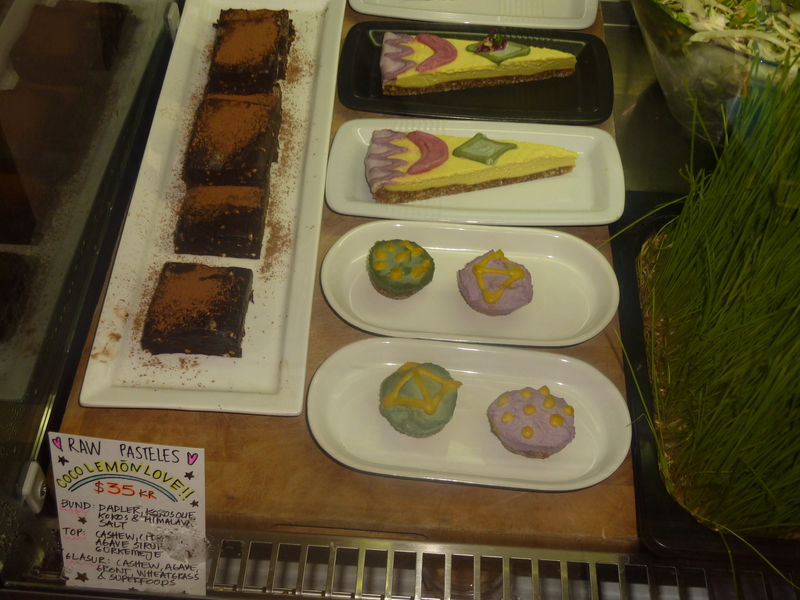 In the sweets section I saw some colorful creations with cashews and chocolate brownies. Dehydrated sweet potatoes, carrotrice, zuccini pasta, green herb dip, teriyaki dip, hummus, rice paper rolls and soft bread. Yes it was a nice meal indeed! Everything was really flavourful and left me very inspired to finally start making some raw dishes at work.. The last days at school I had lectures with Steven Acuff, another health expert. Stevens take on nutrition and a healthy lifestyle appealed to me. The macrobiotic way of eating follows the principle of balance, balancing yin and yang. Some foods/substances that are very yin (expanding) are sugar, alcohol, coffee, chocolate, refined flour products, hot spices, chemicals/preservatives, commercial dairy products and poor quality vegetable oils. Yin foods are thought to be over-stimulating thus causing the body and mind to be overexhausted. Foods that are yang (contracting) are denser, heavier and strengthening, but can cause stagnation if eaten too much: poultry, meat, eggs and refined salt. Whole grains, sea vegetables, beans, nuts/seeds, vegetables and fruit are somewhere in the middle and considered to be balancing foods. I found this principle to be very helpful and practical. Even though I strongly believe in the power of raw and living food I have struggled at times with not feeling balanced on a high raw diet. Now, thanks to my new knowledge I realise it was because I was having too much fruit (sugars)- it was too yin. Breakfast especially has been a challenge, as much as I would like to just have green smoothie for breakfast, it’s just not working for me and my blood sugar. Instead I took Stevens advice and made miso soup and salad for breakfast the last two days. Miso soup You can use any vegetables/seaweed/grains (brown rice, quinoa etc) you have at home but in mine I put: Onion, garlic, ginger, okra, cabbage, zucchini and carrot. I sautéed the vegetables in 1 tbsp of organic coconut oil. 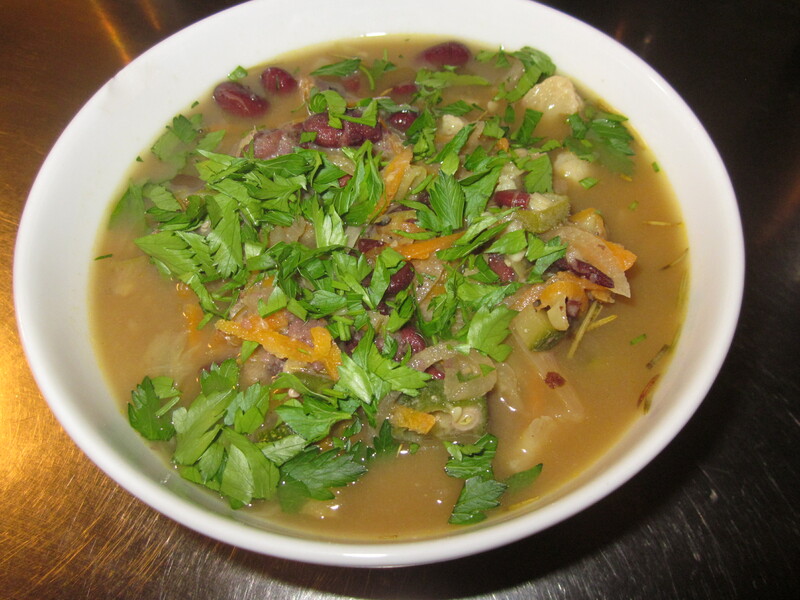 Then I added some water, kidneybeans, shoyu, rosemary and let it simmer for a few minutes. In the end I mixed in the misopaste, without cooking it.I didn’t have any seaweed at home but arame or wakame would have been nice to throw in there. The key ingredients here are coconut oil, vegetables/sea weed/beans/grains and unpasteurized organic miso paste(which you can find in the health food store). Steven also recommended umeoboshi paste for seasoning. .
but also all the toxic substances that we voluntarily dump into our bodies. All of the following cause stress on our liver: Caffeine, refined foods, artificial sweeteners, saturated fats (rancid fats and trans fats), alcohol, preserved foods, smoked meats, refined salted and roasted nuts/seeds, drugs. We can support our liver by eating certain foods that contain nutrients needed to assimilate and get rid of toxins in the body. Brassica family (broccoli,cauliflower,cabbage etc), beets, carrots, lemon, grapes, pomegranate, apples, sulfur containing foods: onion, garlic and eggs. 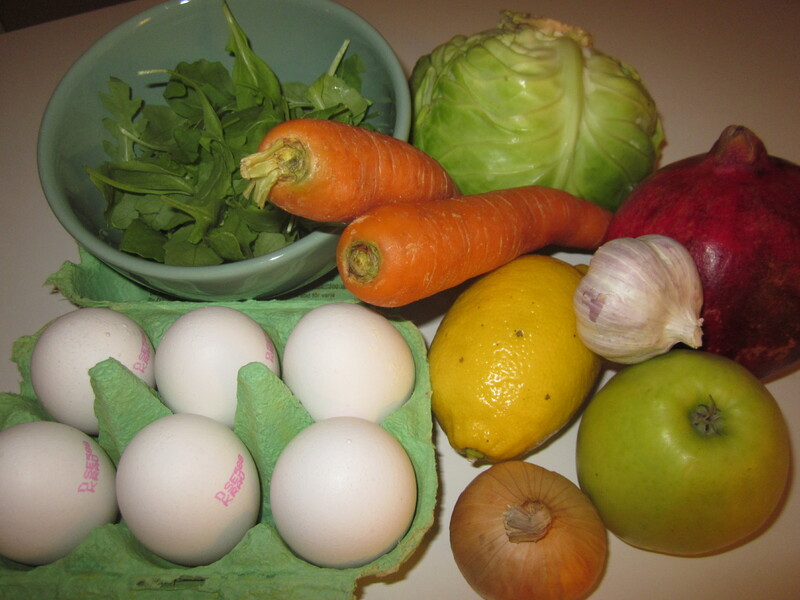 When I went through the list I found most of my favourite foods there: Onions, lemons, garlic, eggs, apples.. One thing I hadn’t been eating was the brassica vegetables, turned out to be good though, because they contain substances that suppress the thyroid. Later I learned that I had some thyroid issues, so it explained my unwillingness to eat broccoli! I was impressed when I realised that I had intuitively been craving all the right foods: eating liver supporting foods and avoiding the ones that would suppress my thyroid function. If I’ve learned anything so far it is that there is no specific diet or healing method that works for everybody. Instead we should learn to listen to what our bodies are telling us eat intuitively. Don’t confuse this with cravings for unhealthy foods! If you´re on a standard or junk food diet, you will first have start introducing fresh and green foods into your diet. Once you do it doesn’t take long before your body starts asking you for more of the good stuff: Greens, fruits, salad,nuts/seeds, smoothies and juices. I promise! After two weeks away from home, today I got back to Stockholm. Upon my return I stopped at the store and picked up some groceries; walnuts, cashews, greek sheep’s milk cheese, parsley, cucumber, tomatoes, bananas, grapefruit, lemons, fresh mint, green apples and a big green celery. 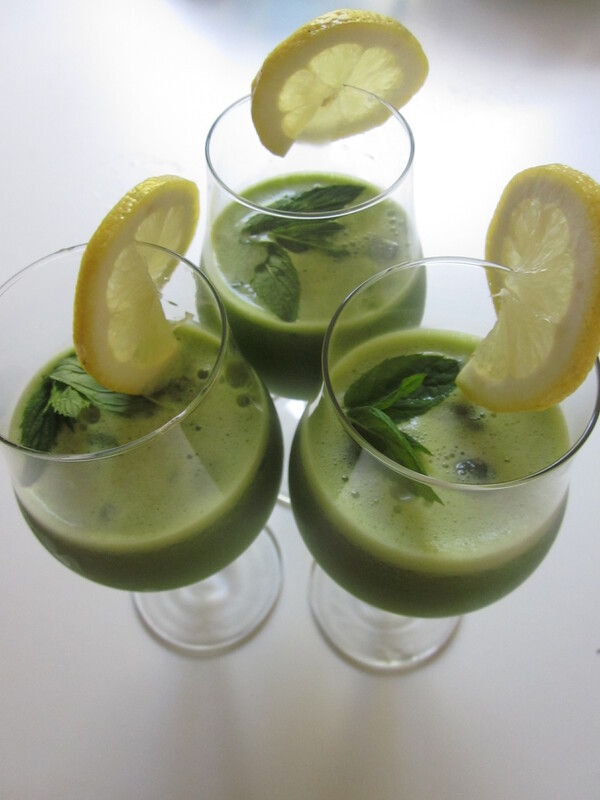 To celebrate my coming home I made a large batch of green juice with pineapple, cucumber, celery, lemon, ginger and mint. 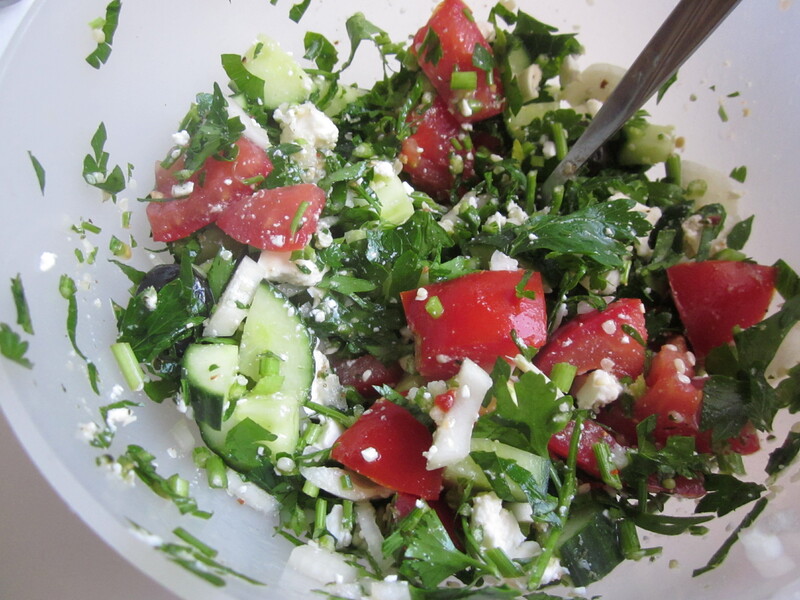 For dinner I chopped up a salad real fast: Parsley (stems and all), cucumber, tomato, olives, feta cheese, hempseeds, onion and flax/lemon/garlic dressing. Medecine for me (who got a cold for the first time in two years).